NASA uses many types of robots. Some NASA airplanes and spacecraft are considered robots. Learn the main parts of any robot in the Robots background information. The More About Robots links lead you to sites with more facts, pictures, videos and interactives that show the variety of robots used by NASA. Different kinds of NASA robots. Preview video clips, audio clips and images under Robots Resources on your left. Download the ones you want to include in your podcast. When we think of robots, we often picture an android -- a robot built in a human form. But robots come in all shapes and sizes. They may be round like a ball or built like an insect. They can be small enough to fit in your hand or as large as a school bus. No matter the shape or size, a robot is a complex, electronic machine. Humans program robots to do work. But robots can also play soccer, make music and study planets. Work in places too dangerous for humans, such as volcanoes, areas of high radiation and environments with no oxygen. Do repetitive tasks that may bore people. Go where humans cannot go, such as small places, tight spaces or other planets. Work without stopping, becoming tired or getting distracted. Some robots are used for building and assembling objects. They are programmed to do the same job repeatedly. Other robots may be teleoperated, or controlled remotely. They can do more than one type of job. They also may be autonomous, meaning they are programmed to react to their environment and "think" about what they should do next. NASA uses all types of robots. Industrial robots build materials for NASA's newest rockets. Unpiloted airplanes help NASA study ice near the Arctic Ocean, monitor the atmosphere and test hypersonic engines. Robotic spacecraft study the moon to find the best place for humans to build a lunar outpost. They also orbit other planets. Robotic satellites study Earth from space. Rovers on Mars search for evidence of water on the Red Planet. Space telescopes that give us dazzling views of the universe are also robots. Even the International Space Station has a robotic arm to help move equipment and astronauts. The station’s large robotic arm is named Canadarm2. It was built by the Canadian Space Agency. Another Canadian robot, the Special Purpose Dexterous Manipulator is the station's robotic handyman. It is often called "Dextre." 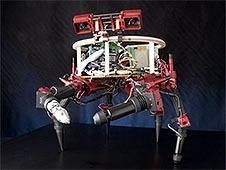 It is a smaller, two-armed robot capable of handling delicate assembly tasks on the space station. Whether robots are building something on Earth or orbiting another planet, they are made of systems. The type of system that makes up the robot depends on the tasks it will perform. All robots are made of one or more systems. To control movements and store information -- the computer "brains"
To give the robot a structure. The body is the mechanical hardware, and the shape depends on the robot's purpose. To activate the robot. Robots can be powered in many ways. To do the work that the robot was designed for. Tools are unique for the robot's task. Robotic missions help NASA investigate environments and plan future missions before sending humans to uncharted territory. NASA will continue to use robots to explore places where humans cannot go.